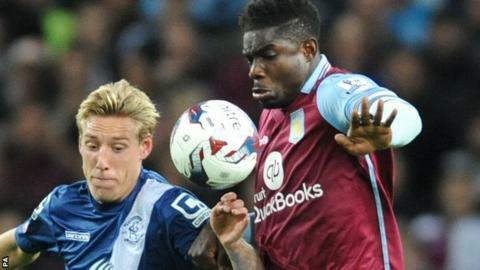 Aston Villa team captain Micah Richards says lack of experience has been a cause of their struggles this season, claiming that their summer signings may not have been "Premier League-ready". "People are saying we've not bought quality. I don't necessarily agree with that. All players need time," defender Richards, 27, told BBC Sport. "In our situation, we could have done with some more experienced heads." Villa are bottom of the table with only five points from their first 13 games. "The club have bought well," continued Richards. "But they've bought on potential rather than Premier League-ready. "I'm not saying they're not good enough. They're just going to need time. That's my honest assessment of it. "The Premier League is a different beast. You can be the best player in France, Spain or Italy but the way the game is played here, with how fast and physical it is and the speed and power, it does not matter how good your technical qualities are, sometimes it's a bit too much." After Martin O'Neill left in the week that the new Premier League season kicked off in 2010, Villa finished ninth under Gerard Houllier and Gary McAllister. Since then, they have finished in the Premier League's bottom six for the last four seasons, consecutively coming 16th (38 pts), 15th (41 pts), 15th (38 pts) and 17th (38 pts). Villa, still reeling from the summer departures of Ron Vlaar, Christian Benteke and particularly Fabian Delph, made 12 new signings in the summer, of which only two, Richards himself and his former Manchester City team-mate Scott Sinclair, had previous Premier League experience. They have just picked up two points from their last 12 matches since winning 1-0 at Bournemouth on the opening day of the season. Tim Sherwood was sacked on 25 October, the day after the 2-1 home defeat by Swansea City, and just hours before Villa were despatched to the bottom by Sunderland's local derby win over Newcastle. They then went out of the League Cup at Southampton under caretaker boss Kevin MacDonald, who was still in charge of picking the team when Villa lost 3-1 at Tottenham on the day of new manager Remi Garde's appointment on 2 November. In his first game in charge, Garde's team held title-chasing Manchester City to an encouraging 0-0 draw at Villa Park. But Saturday's 4-0 defeat at Everton could have been worse, exacerbated by Sunderland's win at Crystal Palace on Monday, which left Villa four points adrift at the bottom going into Saturday's home game with Watford. To add to Villa's woes, it then emerged that young midfielder Jack Grealish had visited a Manchester nightclub following the loss at Everton. He was then seen out again in Birmingham on Sunday night, when the players were due in for training the following morning, and has since been disciplined by being asked to train with the club's Under-21s. Richards labelled Villa's performance as their worst yet since he signed from Manchester City in the summer - an ominous sign as Villa look to avoid being relegated from English football's top flight for the first time since going down under Billy McNeill in 1987. "We weren't even fighting for each other," said Richards. "And, if you don't have that fight in the Premier League, there's only one way you're going. "That's the first time this season I've thought: 'You know what, we actually are in trouble'. And, if we don't get it right, we're going to go down. "I said after the game it was lucky to be only 4-0. They bossed it from start to finish. We didn't win a challenge. We were nervous on the ball. Against Man City, at least we looked like we could keep the ball and play some good football. "If you look at our season up to now, West Brom and Liverpool were the only two games in which we definitely deserved to lose. In all the rest we could have nicked a draw or even got a win. Against Everton, we didn't really have anything." Micah Richards was talking exclusively to BBC Sport's Pat Murphy.